NASA astronaut Jeff Williams will today enter the International Space Station's (ISS) Bigelow Expandable Activity Module (BEAM) - the pump-up podule on trial at the orbiting outpost "to investigate the potential challenges and benefits of expandable habitats for deep space exploration and commercial low-Earth orbit applications". 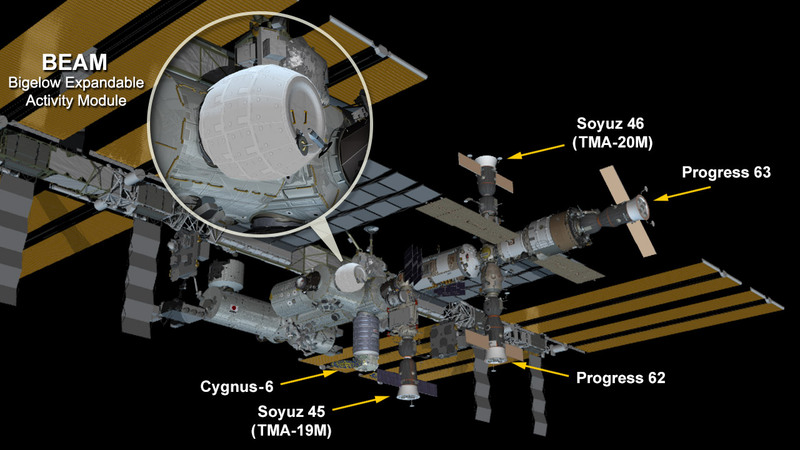 BEAM arrived at the ISS back in April, and after an initial failed engorgement, was finally fully inflated to 16m3 at the end of May. NASA says of Williams' first foray into BEAM: "He will take an air sample, place caps on the now closed ascent vent valves, install ducting to assist in BEAM’s air circulation, retrieve deployment data sensors and manually open the tanks used for pressurization to ensure all of the air has been released. "He will then install sensors over the following two days that will be used for the project’s primary task of gathering data on how an expandable habitat performs in the thermal environment of space, and how it reacts to radiation, micrometeoroids, and orbital debris." BEAM isn't intended for general use, and astronauts will only enter the module three to four times each year "to collect temperature, pressure and radiation data, and to assess its structural condition". BEAM's structure comprises (from inside to out) an air barrier (bladder), structural restraint layer, micro-meteoroid and orbital debris (MMOD) layers, external multi-layer insulation (MLI) and an exterior silica fibre cloth (BETA cloth). NASA reckons the chances of the podule suffering a puncture are "extremely low", and should it spring a leak, it will deflate slowly rather then burst.